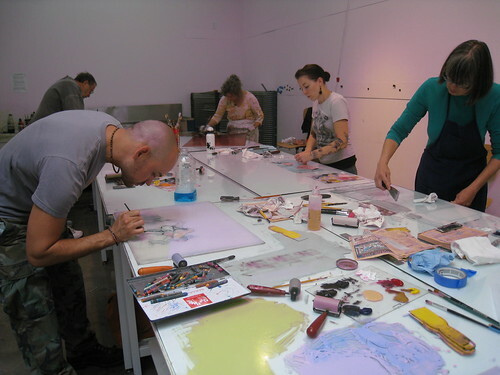 This past weekend, in case you wondered what that energy was in the atmosphere – I’m here to tell you that it was the enthusiastic printmaking activity going on throughout the Bay Area. 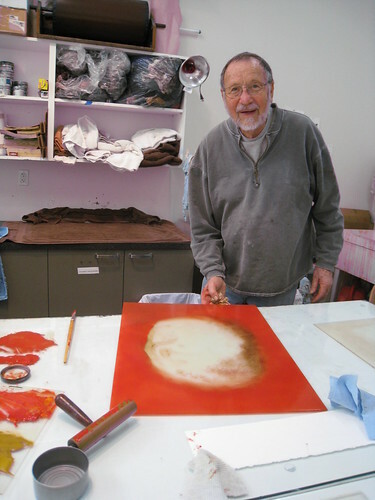 From Berkeley to Monterey, more than 60 artists participated in eight printmaking workshops to create some of the best monotypes I’ve seen in my nine years at the ICA. 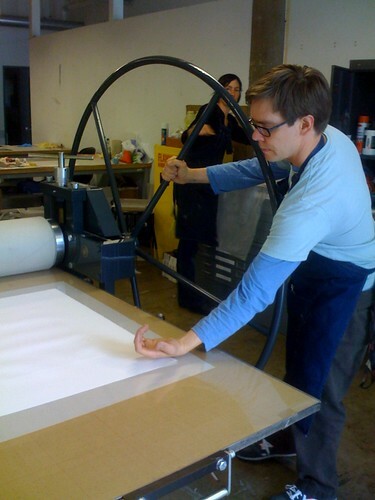 While ICA Print Center Director, Fanny Retsek was hard at work leading the ICA’s workshops, ICA Assistant Curator Susan O’Malley visited the University of San Francsico, Lis DuBois, ICA Development Maven dropped by the ICA’s Print Studio and ICA Preparator, Mike Oechsli checked out the workshop at San Jose State. I ventured up to Berkeley to see the art making at Kala Art Institute and then back to the Pacific Art League in Palo Alto before ending up at the ICA. Not only were the prints amazing, but the artists were incredibly happy. 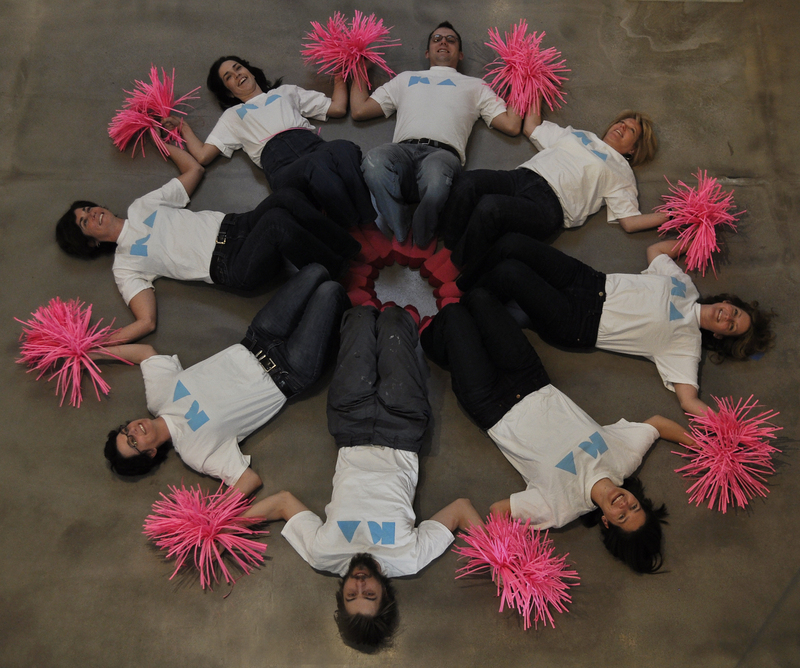 For the first time in the MM’s 15-year history, we lengthened the workshops from 4 hours to 8 hours. Having a full day to devote to the printmaking process not only resulted in happier artists, but higher quality work. No one was panicking to finish up. Instead, everyone was excited about what they’d accomplished and what more they were going to be able to achieve. This all leads to what I predict will be the best Monotype Marathon exhibition ever AND – if the bidders are as happy as the artists – the best MM fundraiser yet! As the prints come in to the ICA, we will be documenting them and adding the images to our Flickr stream. So, keep checking back to preview the work. I promise you are going to LOVE it! Can’t wait to see all this wonderful work! Maybe this year I can use my tax return in an artful way. This is my second trip to Marfa and I love it more than ever. Lorri Keshner and I flew to El Paso on Thursday, February 19th and drove 3 hours to Marfa – in the middle of nowhere. The drive was breathtaking and the sense of calm here is truly intoxicating. It is some of the most beautiful and humbling landscape I have ever seen in my life. I can’t begin to describe what it’s like – the vastness of the land. It might be the one place that I may be able to truly grasp the notion of infiinity. You can see forever – literally. It’s absolutely overwhelming — especially for a New Yorker! and half on ridiculously unpaved road through the Pinto Canyon. At every turn, the landscape transforms and is something entirely different than what it was around the last bend. The drive took about 2 1/2 hours. The only other “attraction” was a long-abandoned adobe church. It appears that there has been some work done to the roof, but otherwise it is a skeletal structure — the only significant one in this town of 16. We turned east along the River Road, headed to Presidio, TX. Along the way we came upon this small graveyard. Most of the names are Mexican and all of the engravings are in Spanish. The graves dated from the early 1900s to about 2000 and they all face the border, towards Mexico. It would seem that in this barren and desolate countryside these people needed to bury their own dead. Oh,fer cryin’ out loud Cathy. Would ya just move here already? Call me next year and I’ll drive out to meet you. BTW, it’s Go Texan Day here in Houston, all the trailriders are coming in for the rodeo. I have to ask. 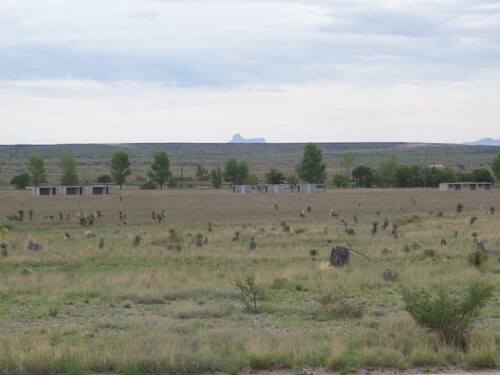 Why Marfa/ Riudosa? There’s a lot of the southwest that looks like this. Stay safe! Since you’re in Marfa, you’ll want to listen to Nina Katchadourian’s “Marfa Jingles.” I’ve only heard clips on her music/myspace page but it may provide a nice soundtrack to your Marfa wanderings. Marisa, this is great, thank you for sharing! I love Nina Katchadourian’s work, she is hysterical and I didn’t know about this project. Cathy was in Marfa last week most likely visiting the places Nina is singing about. The expansive landscapes from the photos are inspiring. No wonder so many interesting creative projects come out from there. As a reply to ‘Kathy’, I have to say, Marfa is a premier art destination. What I find fascinating is that Cathy was so compelled by this landscape that it is what she commented on more than any other aspect of our visit. Donald Judd’s beautiful boxes are displayed in gorgeous natural light at the Chinati Foundation, which Judd helped found during his life in Marfa. Ballroom Marfa is a nationally recognized gallery, and Gallery Urbane features artists Cathy was interested in meeting. Everywhere one goes in Marfa, there is a conversation about art and artists. Nevertheless, it was the big, mysterious landscape that really captivated Cathy, and she isn’t the only one. And the more remote and rugged, the happier she was! This morning I found myself enthusiastically encouraging Susan to research dunk tanks. It’s been downhill ever since. I think the three-day weekend is overdue!